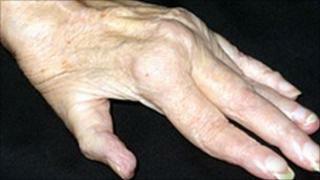 Taking statins may reduce the risk of rheumatoid arthritis, a study suggests. Israeli researchers looked at 1.8m patients and found fewer incidents of the joint condition among those who took the cholesterol-busting drugs. It was thought statins could ease symptoms in those already diagnosed by stopping the over-production of tissue between the joints. But the Maccabi Healthcare Services Research Institute study suggested they could stop it developing altogether. The team discovered 2,500 cases of rheumatoid arthritis, the debilitating inflammation of the joints which affects about one in 100 people. They found that those people who were on statins, now commonly prescribed to prevent heart attacks, were 50% less likely to develop the condition than those who were not regularly taking the drugs. The relationship in this trial between adherence to statin therapy and incidence of rheumatoid arthritis is unclear, but the work builds on existing knowledge. However, the researchers acknowledged that the work, published in the journal PLOS Medicine, now needed to be confirmed in other populations. Jane Tadman, of Arthritis Research UK, said: "Our own published research and that of researchers in Japan has shown a modest but significant effect on inflammation in rheumatoid arthritis, and this latest piece of research adds further evidence of this link. "We now need larger clinical trials to confirm further that statins can reduce the risk of developing rheumatoid arthritis."